Woman to Woman: Happy Renewing Year! The turn of a new year can be a mixed bag of emotions. It can bring hopeful expectation of new beginnings with empty calendar pages, pristine planners and clean white journal pages waiting to be filled with new resolutions, plans and goals. The changing of the year can be accompanied by anticipation of the future - plans for travel and vacation, an upcoming wedding, the expected arrival of a new baby, or the anticipation of a hard earned graduation or retirement. But, the arrival of a new year can also be the reminder of the unfulfilled hopes and dreams of the previous year, of failure, of aging and the relentless speed of life zooming by. In other words, to some the new year reminds us that the passing of time means we are day by day growing older and will one day pass away. It can cause us to evaluate our life's accomplishments and to question if we've lived our life well. Yes, the passing of an old year and the arrival of a new year can definitely be a mixed bag of expectation and introspection. 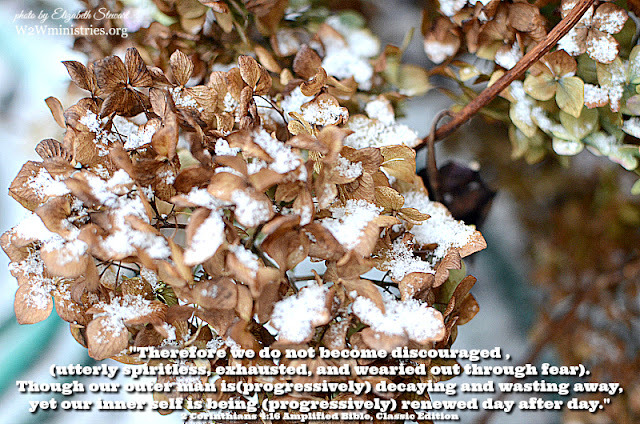 So, how do face the new year with more hope and less discouragement? We cannot change our yesterdays. The old year with all of its highs and lows, successes and failures, triumphs and tragedies, is gone. Courage accepts the challenge to not remain a victim of yesterday and the things we cannot change, but to do something about the things we can. We cannot change the past. We cannot rewrite the ways we might not have lived up to our own expectations. But, we can change our today. May I suggest that, perhaps, we set ourselves up for failure by looking at the whole package of a 365 day year. It's much easier to make significant changes when we take it in little bites of one day at a time. I remember when I was a young wife and mama, with a husband who was still in college and also working full time on the swing shift and working in youth ministry on the weekends, crying out to God to help me be the wife and mama I should be for that day. The next morning I prayed the same prayer. One day at a time God gave me the wisdom, strength, love and grace to do what I saw as an overwhelming and daunting job. What is something you regret not accomplishing last year or something that weighed you down last year that you don't want to drag into 2018? What courageous change can you make, one day at a time, to work on your goal or to let go of whatever hindered you in the past? Ask God for His help! We cannot change the simple fact that we are aging and that as we age we go through some inevitable physical changes. We can, however, courageously choose to be the best us we can be for the age we are. We cannot reverse time or its affects, but we can take care of ourselves physically, spiritually, and emotionally, so that we don't age prematurely. "Courage to change the things I can" could be translated, "it takes some grit and some guts and some gumption to be the best you you can be no matter your age!" Our inner being can be renewed and get stronger and stronger with age. God's intention and will for us is that our innermost being gets stronger and more and more like Him day by day. But God also gave us a free will. We can resist God's purposes and processes within or cooperate with Him as He does His transforming and renewing work in us. I want more than a happy new year-I want a happy renewing year. I want to let go of yesterday's disappointments and to courageously change the things I can in 2018. I want to yield joyfully to God's transforming and renewing work within me. I want you to have a happy renewing year, too!